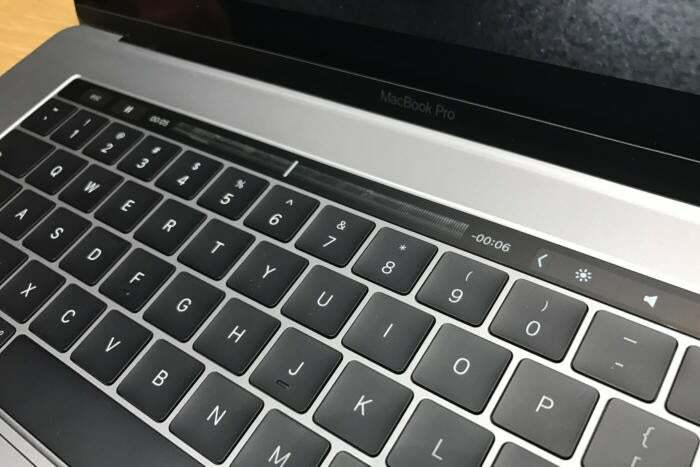 Apple's newest Mac packs a strip of iOS-style contextual controls into the Touch Bar. There's also a new keyboard and four Thunderbolt 3 ports. It’s thinner, lighter, and smaller all around, but the new MacBook Pro makes a big impression. The trackpad on the 15-inch version is downright ridiculous—twice as large as the trackpad on the previous generation—but I didn’t look down and say, “Holy cow, that is a seriously huge trackpad,” until I’d been using it for a couple of minutes. Because it’s really all about that gorgeous Touch Bar. Apple doesn’t do touchscreen Macs, but the Touch Bar adds a strip of ultra-handy iOS-style contextual controls right where you need them, and the rest of the MacBook Pro got great updates too. After my limited hands-on time, I think it’s got the right mix of power, portability, and ports to satisfy users of previous MacBook Pro and MacBook Air models. Let’s dive right into my first impressions—we’ll follow up with a full review later. The Touch Bar, which replaces the row of Fn keys on top of the MacBook Pro’s keyboard, enables new functionality like Touch ID to unlock the Mac and make Apple Pay purchases in Safari without needing to authenticate with an iPhone or Apple Watch. 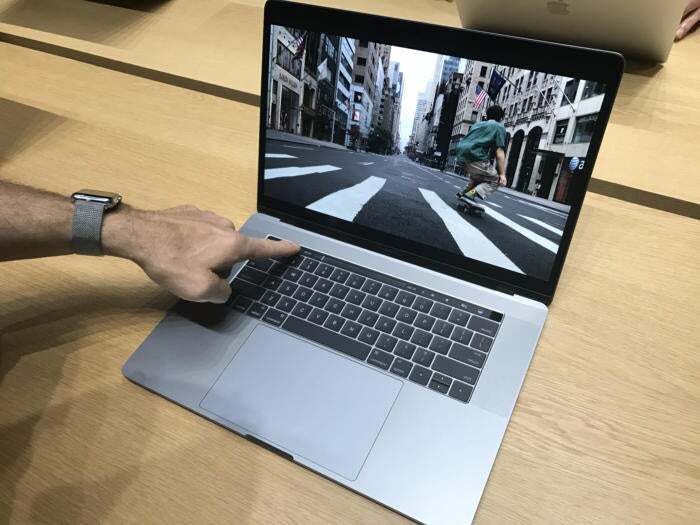 It’s made of smooth glass, so it feels great under your fingers, just like the trackpad itself. The Touch Bar changes based on what you’re doing, including predictive controls in some apps. The Touch Bar supports multi-touch, in case you need to tap or slide on more than one control at once. This would come in handy in some apps, like djay Pro, but since the bar isn’t really tall enough for common multi-finger gestures like pinch-to-zoom, I was content to poke at it one finger at a time. I love how you can customize the Touch Bar’s default controls. Just pick View > Customize Touch Bar from the Finder menu, and you get a full suite of buttons you can drag right down to the Touch Bar. The options are similar to what you see when customizing the toolbar in your Finder windows. But the coolest part of the Touch Bar is how quickly it changes as you switch apps. I used it for scrolling through a full-screen album in Photos, as well as for scrubbing through the timeline in Final Cut Pro. Both were fast and responsive. However, when I opened a new Mail message and started typing, the QuickType suggestions shown in the Touch Bar lagged behind my fingers. I had to consciously slow down to be able to see the predictions and select them from the Touch Bar, so it was faster to just type the entire word with my fingers. Happily, pulling up the scrolling emoji menu in Messages and choosing an emoji from the Touch Bar is a million times faster than pressing Command-Control-Space and using the Characters menu, like I have to do on my MacBook Air today. The other killer Touch Bar feature might be predictive suggestions in Mail. When you’re looking at a list of messages in your Inbox, you’ll see a button on the Touch Bar that says “Move to Vacations” or the name of another folder the app thinks is suitable. Mail seems to be guessing based on context, such as the sender and content of the message, and I can’t wait to see how well it does with the volume of email I get every day. 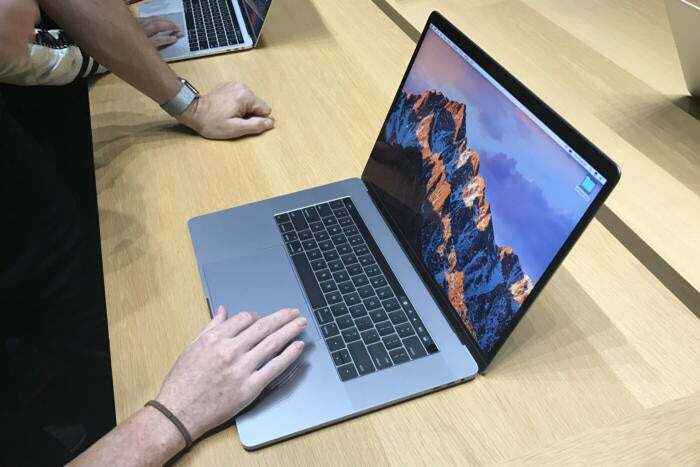 The new MacBook Pro models have a low-travel keyboard similar to the 12-inch MacBook, but Apple says it uses a second-generation butterfly mechanism to give the keys a better feel. They don’t seem to travel physically further, but it’s possible Apple did increase the travel distance slightly. My guess is that it’s augmenting the physical sensation of pressing a key with a little bit of haptic feedback—I’ll let you know if I can get Apple to comment. UPDATE: Nope, my guess was wrong. Apple says it just used slightly different materials for a different feel under your fingers. No haptics in the keyboard. The keys feel about the same to me as on the MacBook. They don’t wiggle back and forth if you happen to strike one off-center, and they make a deep clicking sound when you pound on them. But when I switched back to my trusty 2013 MacBook Air to write this hands-on, my fingers immediately preferred the bouncier mechanism of Apple’s old laptop keys. I’ve never had trouble with the MacBook keyboard, and I’m sure I’ll get used to this one too, but I do like the old kind better. If you were worried Apple would ditch the headphone jack on the MacBook Pro, you can exhale now. (After all, Apple did ask its customers a while back if they were using it!) 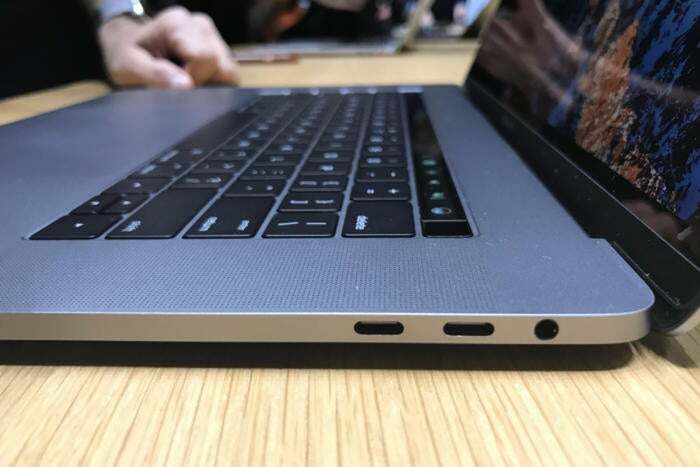 Every MacBook Pro model has a headphone jack on the right-hand edge. Don’t ever leave us, audio port. You also get four Thunderbolt 3 ports on the 13-inch and 15-inch models (only two on the lower-end 13-inch MacBook Pro with Function Keys, but we’re discussing the Touch Bar models here). Apple put two on each side, and it’s kind of cool how all the ports can charge the laptop or connect to Thunderbolt, DisplayPort 1.2, and USB-C devices. I’m used to having dedicated ports for each IO method, so the flexibility is appreciated, and it’s a relief Apple went with four instead of, say, two. You’ll still need adapters for some things, like peripherals that use USB-A or Thunderbolt 2 ports, or an SD card reader, since that slot is gone. But having multiple ports might let you avoid picking up one of the USB-C docks that MacBook owners need if they want to connect more than one device at a time. The beautiful Retina screen is unchanged from previous generations, and with the new Mac lineup, every notebook Apple sells is now Retina. In our full review we’ll dive more deeply into the performance of the updated processors and GPU, as well as Apple’s promised 10 hour battery life. But from what I’ve seen so far, the updated MacBook Pro is going to be worth the wait.